Though these three regions do not lie together geographically, on this trip I had only one or two visits in each so they are grouped together for convenience, all sitting north of Stellenbosch and Somerset West. Paarl is part of the Cape’s historical wine route, the vineyards sitting in the shade of the Drakenstein mountains. The first wine ‘brand’ in Paarl was the giant KWV, a cooperative cellar set up in 1918, though the nearby Nederburg estate is perhaps the best known Paarl name, famed for its annual charity auction. Both producers are included in my visit. A 30 minute drive north along the R45, through impossibly beautiful countryside brings you to the Franschhoek Valley (though a slightly longer route over the Franschhoek Pass is even more spectacular). Founded by Huguenot French settlers, Franschhoek still wears its Francophile traditions with pride in the names of streets, restaurants and some wineries. And indeed it is gastro-tourism that brings many people to this pretty town with its myriad fine dining and gourmet shopping opportunities. This is a world removed from Tulbagh, 90 kilometres north-east of Franschhoek. Nestled in the Tulbagh basin and almost entirely enclosed by mountains, Tulbagh is, and feels, remote. But despite its hot inland climate, cool air is funnelled through the mouth of the basin to give excellent growing conditions. Once known as Tulbagh Mountain Vineyards, the same winemaking team are charged with new responsibilities. The beautiful and historic Nederburg estate makes huge volumes, but the upper tier wines are excellent. Young winemaker Hagen Viljoen is newly in charge at this interesting and diverse empowerment estate. This important Paarl cooperative has struggled to find its feet in the modern era, but signs are hopeful. There is a danger of some confusion with the multiplying sub regions and zones within the Walker Bay area (itself part of a larger region called Overberg). Many lovers of South African wine came to recognise the name Walker Bay on the label in the late 1990s as a signal for very high quality Pinot Noir, Chardonnay and Sauvignon Blanc. But since then other names like Hermanus, Bot River and Hemel-en-Aarde have further defined their own boundaries within Walker Bay, and are exploring their special characteristics in an attempt to establish their own identities. Pictured above: Ataraxia, Hemel-en-Aarde. Whilst this is an unstoppable evolutionary process, it does make understanding the sub-regions a little more challenging. Bot River is the western entrance to the region, lying between Elgin and Hemel-en-Aarde. The small band of growers there, led by the formidable Niels Verburg of Luddite Wines, is keen to be seen as a region in their own right. Next up comes Hemel-en-Aarde, with some of the closest vineyards to the ocean, but the land rising as it follows the R220 road away from the town of Hermanus. Here is gains altitude, but also a set of subtly changing sub-names too as it divides into Hemel-en-Aarde, Upper Hemel-en-Aarde and Hemel-en-Aarde Ridge. The sub-divisions and the shifting nomenclature are confusing, yes, but thankfully the Walker Bay area’s many offspring are producing some of the Cape’s most exciting wines. Peter-Allan Finlayson originally rejected a career in winemaking, but it was only a matter of time. The search for extraordinary vineyards has driven Chris Alheit to make some terrific white wines. Gordon and Nadia Newton-Johnson make some of the Cape’s most alluring and expressive Pinot Noir. For whom the bell tolls: Kevin Grant is the answer, unflinching and brilliant Chardonnay obsessive. A tasting with Walker Bay originals Hamilton-Russell & Bouchard-Finlayson, plus newer players. Niels Verburg is the colossus behind Luddite Wines, and the lead singer of the Bot River band. It has been fascinating to watch the development of the Elgin Valley since my first visit there in 2005 when there were only three estates, though a number Stellenbosch producers were already taking fruit from this cool apple and pear-growing area that still boasts as many orchards as vineyards. Returning in 2013, it was clear that energy levels remain high in this valley where the average age of its wine estates is only around three years. With vineyards running from 300 to close on 500 metres in elevation, this is true cooler climate country where varieties like Riesling, Gewurztraminer and Pinot Noir flourish. Now there are more than 20 estates here, many of which have already carved international reputations for quality. Elgin is a bowl-shaped valley, surrounded by the Hottentots-Holland mountains. Those slopes mean a variety of aspects to the sun and prevailing winds can be found, and a variety of soils too – sandstone with gravel, clay and shale deposits – in these often misty vineyards. Elgin may still have to play it trump cards – who knows? Will Elgin Syrah turn out to be a world beater, or some other variety yet to be considered, let alone planted? Marine biologist turned winemaker James Downes doesn’t follow the herd with his unusual range. Lawyer turned winemaker Joris van Almenkerk has definite thoughts on wine and the UK market. The aromatic kings of the Elgin Valley, still fashioning superb Rieslings, dry and sweet. Constantia is the closest quality vineyard area to Cape Town – indeed it’s a southern suburb of the city where broad, oak-lined avenues and comfortably settled wine farms wear a graceful Victorian air. An easy place to pop round for a tasting or lunch in one of its many fine restaurants, it is the white wines of Constantia that put the area on the map, as well as some glorious dessert wines including daddy of them all, the much vaunted Vin de Constance. Constantia may lack on the raw energy of Swartland or fast-paced development of Elgin, but its many long-established estates maintain superb quality. 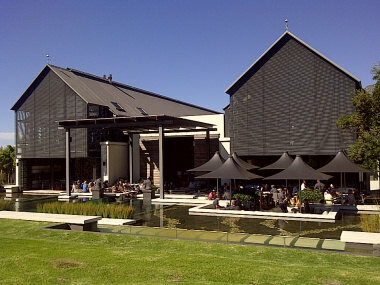 Pictured is one of the two excellent restaurants on the Steenberg Estate in Constantia. Just south-west of Constantia, Cape Point Vineyards is the only wine estate on the Cape Point peninsula, where it benefits from the cooling influence of the ocean: False bay sits directly below. Also within very easy striking distance of Cape Town, since its first vintage in 2000, Cape Point has become a major tourist attraction for its picnic spots and live events held around the winery, and yet winemaker Duncan Savage is still crafting some of the Cape’s most individual wines. Sauvignon Blanc is the big focus, though literally the day before my visit Duncan had launched his own Savage Wines brand, Sauvingon yes, but a Rhône-style red blend too. One of the first estates reached when entering the Valley from Cape Town, Steenberg is a luxury golf resort but also a producer famed for white wines. Duncan Savage of Cape Point, surfer par excellence, is also one of the Cape’s most respected winemakers with these cool and beautiful vineyards.